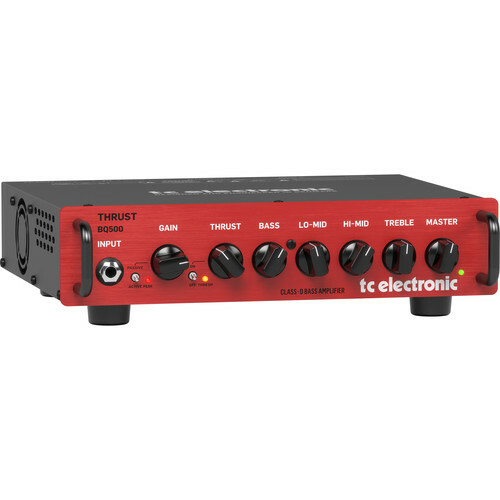 Designed for bass players who want tone and power in a small, lightweight package, the TC Electronic BQ500 is an amplifier head capable of pushing 500W into 4-Ohm cabinets. The amplifier utilizes Class-D technology as well as a high-voltage MOSFET preamplifier to give you the sound of a tube amplifier. A built-in thrust compressor helps you play evenly, and a 4-knob tonestack helps you shape your tone. The amp works with both active and passive basses. In the rear of the amplifier you'll find a speakON connector for amplifiers, as well as a balanced XLR DI output for sending audio to the house or to recording interfaces. This DI output can be sent pre or post EQ. You'll also note a speaker-emulated 3.5mm headphone output for silent practicing, as well as a 3.5mm auxiliary input for playing music from your media player. A rugged steel chassis ensures this amp can stand up to the rigors of the road.